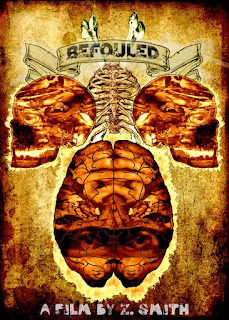 BEFOULED is one of those films that you find yourself sitting through and at the end of it still have no idea what you just watched. As there is no actors, dialogue or a story-line to follow it falls into the category of art. I at least see it as an artistic statement on humanity and how we as humans always find a way to destroy everything in our paths. There is some very disturbing imagery throughout which will leave some people feeling uncomfortable, especially the animal cruelty scenes. The way the whole film is shot is a mixture of kaleidoscopic shots and shaky camera so do bare in mind that it could make you feel quite nauseous. Throw in a soundtrack that is very industrial and you have a film that hurts all your senses. The best way to describe it is a kind of FACES OF DEATH and industrial metal music video smashed together. Is it something that I would watch again? No probably not, but I am sure it will have its fans. If you are interested in the sound of BEFOULED then go give the Underground Gorellectors Films Facebook page a LIKE for news on its release and where you can but it..